You are currently not login. Another 2 months have passed and we move to another milestone of our project. We have release/pass our invoice module for user to try out. Its contain one very powerful engine to handle your account payable and receiveable without too much hassle. As for our premium guesst, you will have the power to try out our upgrade reservation system. Other than the invoice, we have successfully expand our database to Microsoft Windows Azure. By having this implemented, you are now able to feel safe that your data is in good hand with on-demand upscaling your system performance. This is available to paid customer. For more information, feel free to look into our SaaS user base packages. Over the last 3 months, anyPiece have manage to strategize and start to intro "anyPiece pioneering project". Some of the key customer have been identify and introduce on board as beta tester on this portal. To speed anyPiece maturity, we have hire 2 new staff on board. 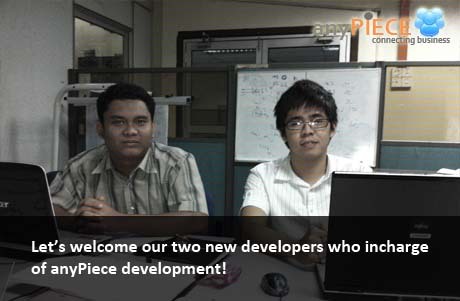 They are Jieh and Hamzah who is primarily handling the development on this portal. This is not all we have done. We decide to release another piece of module to be release out for our existing pool of customer to try out the system. This module is facility reservation system. With this tool, you will be able to create new facility like tour, hotel room or transportation rental. Until next month, happy testing everyone! I would like to say thank you for users who have been using our alpha product from the day 1. Its not easy for us to build this product from scratch since Nov 2010. Yes... its just being 2 months since the idea start to flock in. New year means new function. New function means new possiblity. With this, we would like to share an early preview on what is coming to change the way we work again! Like many believe, picture speak a thousand word. Well... take a look at the picture below. Invoice and Request for Quote is insert into the menu but its still under development. You won't be able to use them for now until further notice. During the alpha testing, we have change the email to make a copy to your email address so that you forward manually to your customer if needed. If the user didn't open the quotation after 4 hours, we will send an email to you to let you know on this. Would like to login and access to resume your session rather than reading the news first. We have put in a big "resume" button on top of your news. Hope you will like this new function that we added. During the alpha testing, we are happy to see quotation are easily created but not all the function is fully utilized. That's why we introduce another 2 helper to ensure everyone is able to fully master the system in no time. Below would be some of the key improvement. Rather than having to download the quotation everytime, you can now have the preview on the fly on the first page. 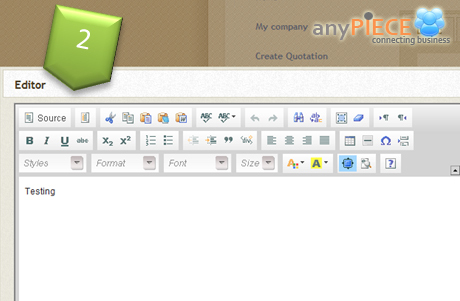 In order to simplify the quotation creation, we have insert auto sorting function base on numeric figure. Feel free to try it out and let us know if you face any issue. We are currently in alpha testing stage. There will be some bug or error that you might face during this testing. Feel free to feedback to kenny.koay@globalconnect.com.my whenever this happen. © 2010-2012. Global Connect Resources. All Rights Reserved.